The Wayne State University School of Medicine has combined the Department of Anatomy and Cell Biology and the Department of Ophthalmology into the new Department of Ophthalmology, Visual and Anatomical Sciences. Dean Jack D. Sobel, M.D., formally announced the merger July 5. "The overarching goal of merging the two departments is to combine research and teaching strengths, utilizing Anatomy and Cell Biology's focus on vision and anatomical sciences/neuroscience research with a similar focus in vision in Ophthalmology," Dean Sobel said. "This also will provide a platform that will leverage translational studies, leading to enhanced technology transfer opportunities." Mark Juzych, M.D., MHSA, professor and chair of the Department of Ophthalmology, will chair the department. 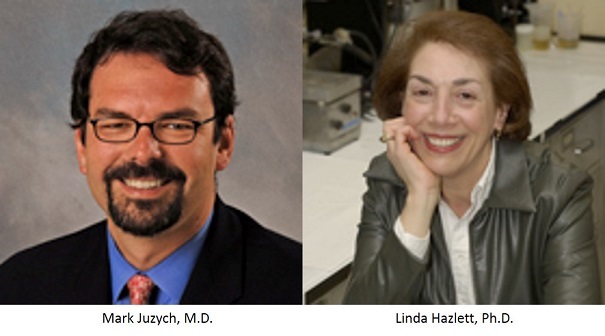 Linda Hazlett, Ph.D., vice dean for Research and Graduate Programs, the Robert S. Jampel, M.D., Ph.D., Endowed Chair in Ophthalmology and distinguished professor, will serve as vice chair, overseeing research, teaching and faculty affairs. She chaired the Department of Anatomy and Cell Biology from 1995 to 2018. Drs. Juzych and Hazlett said the two departments functioned together in research and teaching, and shared office staff. Combining two good departments into a single great department, they said, creates new opportunities to attract financial resources, research opportunities, exceptional faculty, students and philanthropy. Dr. Hazlett has held National Institutes of Health R01 funding for 34 years and is the principal investigator of a P30 National Eye Institute Core Vision grant (held for 36 years in 2018). By maintaining this grant - one of only 38 in the United States -- Wayne State University has been designated a Center of Excellence in eye research for more than three decades. The Kresge Eye Institute, with Dr. Juzych as the most recent principal investigator, has held a Research to Prevent Blindness award for 26 consecutive years, a distinction held by only 30 Ophthalmology departments nationwide. The continued funding of these two major awards stands on firmer footing with this merger, Dean Sobel said, and the possibility of similar opportunities becomes limitless. The new department has more than $10 million in extramural research awards and will be ranked in the top 20 Ophthalmology departments for NIH grant funding in the U.S.